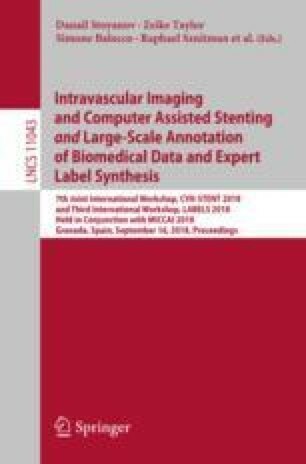 This work presents an automatic method to segment the aortic lumen in computed tomography scans by combining an ellipse-based structure of the artery and an active contour model. The general shape of the aorta is first estimated by adapting the contour of its cross-sections to ellipses oriented in the direction orthogonal to the course of the vessel. From this set of ellipses, an initial segmentation is computed, which is used as starting approximation for the active contour technique. Apart from the traditional attraction and regularization terms of the active contours, an additional term is included to make the contour evolve according to the likelihood of a given intensity to be inside the aorta or in the surrounding tissues. With this technique, it is possible to adapt the boundary of the initial segmentation by considering not only the most significant edges, but also the distribution of the intensities inside and surrounding the aortic lumen. This research has partially been supported by the MINECO projects references TIN2016-76373-P (AEI/FEDER, UE) and MTM2016-75339-P (AEI/FEDER, UE) (Ministerio de Economía y Competitividad, Spain).